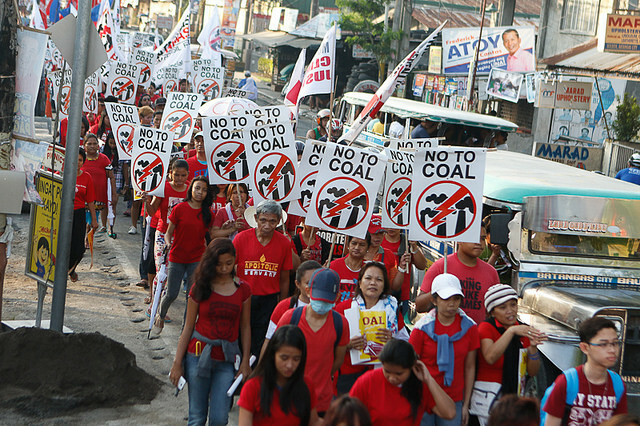 Twenty seven coal power stations are planned for construction in the Philippines. As part of the global #BreakFree protests, around 10,000 Filipinos marched in Batangas City on May 4 demanding an end to coal and transition to renewable energy. The protest comes just five days before national elections. 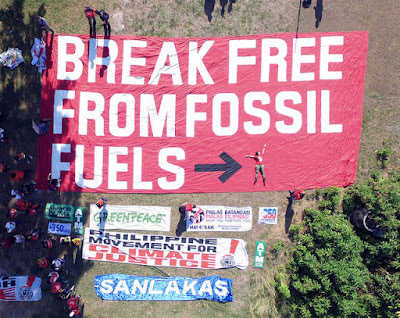 People and civil society groups are demanding that the next Philippines administration cancel all proposed coal plants nationwide and hasten a transition to renewable energy, according to a Greenpeace statement. A Catholic Archbishop Ramon Arguelles of Lipa attended the demonstration and called for other Catholic Church leaders to drop their silence and oppose new coal fired power plants. "I call on all bishops in Asia ... We must support the promotion of clean and renewable energy. I challenge the bishops to publicly speak out and condemn coal. We have to do what God told us to do, to protect the environment," said Archbishop Arguelles. "As shepherds, we must lead the fight to break free from dirty energy," he added, saying that church leaders "need to show full commitment" to Pope Francis' encyclical on the environment and climate change, according to ucanews, an Asian Catholic news service..
Pope Francis issued a major encyclical on the environment and climate change called Laudato Si during 2015. Greenpeace Southeast Asia executive director and former Chief UN climate negotiator for the Philippines Yeb Saño was present.